"One man band" recording, adding tracks one at a time. Live multitrack recording, recording all tracks simultaneously. The manual contains more information on touchscreen support.
" MultitrackStudio is simply the best deal going anywhere in a solid, robust music sequencing software with one of the easiest to use GUIs in the business. The MTS software package is full-featured, includes absolutely world class effects, the best support in the industry and all of this comes in at an unbeatable low price. MTS even handles the Mastering of a finished mix, no need for a separate and expensive "Mastering Software!" 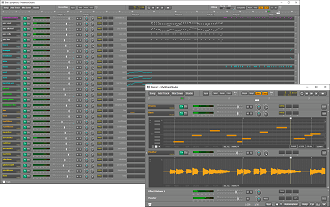 - Clark "Mac" McDonald "
MIDI tracks can be recorded using a MIDI keyboard. You can also use the computer keyboard or even a touchscreen. Instrument sounds can be generated by the General MIDI compatible MultitrackStudio Instruments or external MIDI hardware like a keyboard. VSTi/AUi plugins can be used as well. The powerful mixer structure includes an unlimited number of Effect Return and Group sections, numerous built-in high quality effects and VST/AU plugin support. The Pro edition features automation and powerful sidechaining options. MultitrackStudio proves that multitrack recording using a DAW (Digital Audio Workstation) can be as easy as tape-based recording. Its well thought out design makes it easy to use, and yet powerful. If you like singing and playing your instruments better than trying to figure out some complicated piece of software you'll feel right at home recording in MultitrackStudio! Windows 10, 8, 7, Vista or XP. Windows XP: Sound device with ASIO driver is recommended, but not required. macOS 10.14/13/12, OS X 10.11/10/9/8/7/6. Good quality sound device is recommended, but built-in device works too. For MIDI recording: a MIDI keyboard etc.